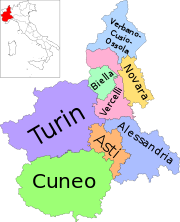 Map of the province of Cuneo. Many important industrial groups have branches in the province: Michelin (Cuneo and Fossano), Saint-Gobain (Savigliano), Valeo (Mondovì), Asahi Glass Co. (Cuneo), ITT Galfer (Barge), Diageo (Santa Vittoria d'Alba) and Nestlé (Moretta). ^ Bole 2011, p. 82. ^ Construction de l'espace au Moyen Age: pratiques et représentations [Construction of space in the Middle Ages: practices and representations] (in French). Publications de la Sorbonne. 2007. p. 391. ISBN 978-2-85944-587-4. ^ Kresl & Ietri 2010, p. 138. ^ Holst-Warhaft & Steenhuis 2012, p. 76. Bole, David (2011). Innovative policies for Alpine towns: Alpine space small local urban centres innovative pack. Založba ZRC. ISBN 978-961-254-254-2. Holst-Warhaft, Gail; Steenhuis, Tammo (28 November 2012). Losing Paradise: The Water Crisis in the Mediterranean. Ashgate Publishing, Ltd. ISBN 978-1-4094-8846-0. Hall, Marcus (2005). Earth Repair: A Transatlantic History of Environmental Restoration. University of Virginia Press. ISBN 978-0-8139-2341-3. Kresl, Peter Karl; Ietri, Daniele (2010). The Aging Population and the Competitiveness of Cities: Benefits to the Urban Economy. Edward Elgar Publishing. ISBN 978-1-84980-693-0. South Tyrol, known by its alternative Italian name Alto Adige, is an autonomous province in northern Italy. It is one of the two provinces that make up the autonomous region of Trentino-Alto Adige/Südtirol. The province has an area of 7,400 square kilometres and its capital is the city of Bolzano. 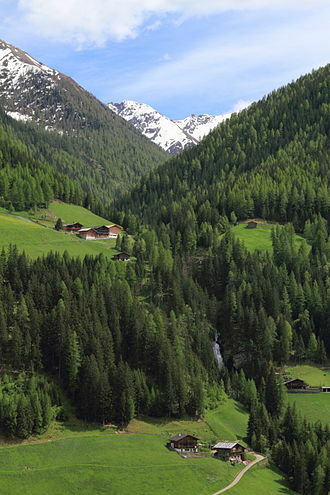 As of 2011, South Tyrol is among the wealthiest regions in Italy, South Tyrol is the term most commonly used in English for the province, and its usage reflects that it was created from a portion of the southern part of the historic County of Tyrol. German and Ladin speakers usually refer to the area as Südtirol, Alto Adige, one of the Italian names for the province, is used in English. The term had been the name of political subdivisions along the Adige River in the time of Napoleon Bonaparte and it was reused as the Italian name of the current province after its post-World War I creation, and was a symbol of the subsequent forced Italianization of South Tyrol. The official name of the today in German is Autonome Provinz Bozen — Südtirol. German speakers usually refer to it not as a Provinz, provincial institutions are referred to using the prefix Landes-, such as Landesregierung and Landeshauptmann. 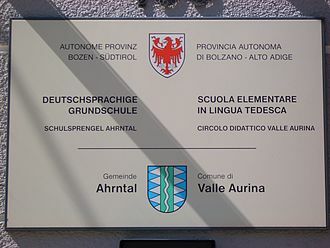 The official name in Italian is Provincia autonoma di Bolzano — Alto Adige, South Tyrol as an administrative entity originated during the First World War. The Allies promised the area to Italy in the Treaty of London of 1915 as an incentive to enter the war on their side, with the rise of Fascism, the new regime made efforts to bring forward the Italianization of South Tyrol. The German language was banished from public service, German teaching was officially forbidden, the regime favored immigration from other Italian regions. The subsequent alliance between Adolf Hitler and Benito Mussolini declared that South Tyrol would not follow the destiny of Austria, the region was de facto annexed to the German Reich until the end of the war. This status ended along with the Nazi regime, and Italian rule was restored in 1945, after the war the Allies decided that the province would remain a part of Italy, under the condition that the German-speaking population be granted a significant level of self-government. The province of Savona is a province in the Liguria region of Italy. Its capital is the city of Savona, which has a population of 61,529 inhabitants, the province has a total population of 280,707. 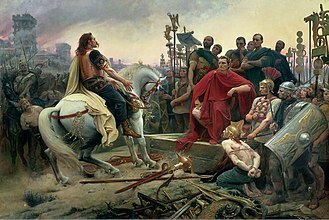 Savona was first settled by the Ligurian tribe, the Sabazi and this support of the Carthaginian Empire led to Savona being conquered by the Roman Empire. 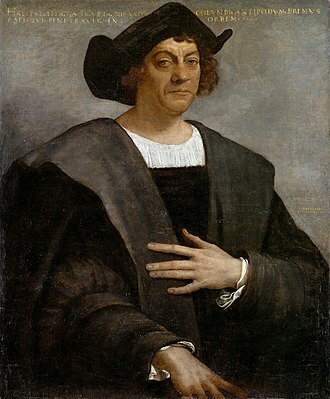 During the Middle Ages, Savona allied with Frederick II, Holy Roman Emperor, in 1440 it fought against Genoa during its war against the Visconti of Milan, in response, Genoa sacked the city and destroyed the port and shipping. It allied itself with the French in the 16th century, but this failed and resulted in Genoa invading the area again. It was occupied by Napoleons French forces at the start of the 19th century, following this, ironworks were founded in Savona and the port revived. The province of Savona is one of four provinces in the region of Liguria which forms a strip in the northwest of Italy. Savona has a coastline on the Gulf of Genoa, the Province of Imperia lies to the west. Ferrero SpA is an Italian manufacturer of branded chocolate and confectionery products and it is the third biggest chocolate producer and confectionery company in the world. The company saw a period of growth and success under Pietros son Michele Ferrero. His son Pietro, who oversaw global business, died on April 18,2011, in a cycling accident in South Africa at the age of 47. The Ferrero Group worldwide – now headed by CEO Giovanni Ferrero – includes 38 trading companies,18 factories, Ferrero International SAs headquarters is in Luxembourg. Ferrero SpA is a company owned by the Ferrero family and has been described as one of the worlds most secretive firms. Reputation Institutes 2009 survey ranks Ferrero as the most reputable company in the world, the recently announced financial results for 2015/2016 show a +8. 2% increment from the previous year. In 1946, Pietro Ferrero invented a cream of hazelnuts and cocoa, derived from Gianduja and called it Giandujot, the initial product came in solid loaves wrapped in aluminium foil, which had to be sliced with a knife, and was succeeded by a spreadable version Supercrema. With assistance from his brother Giovanni Ferrero, Pietro Ferrero created his new company to produce, following his work, Pietro was succeeded by his son Michele Ferrero as chief executive. Michele and his wife Maria Franca relaunched his fathers recipe as Nutella, after World War II, they opened production sites and offices abroad and Nutella eventually became the worlds leading chocolate-nut spread brand. Ferrero is the worlds largest consumer of hazelnuts, buying up 25% of global production in 2014, the company is currently run by Giovanni Ferrero, grandson of Pietro and son to Michele Ferrero. The company places emphasis on secrecy, reportedly to guard against industrial espionage. It has never held a conference and does not allow media visits to its plants. Ferreros products are made with machines designed by an engineering department. Ferrero produces several lines of goods under various brand names, as well as the chocolate-hazelnut spread. The company has produced Nutella since 1964, the production of Nutella uses one-quarter of the worlds annual hazelnut supply. Saluzzo is a town and former principality in the province of Cuneo, Piedmont region, Italy. The city of Saluzzo is built on a hill overlooking a vast, lead, marble, slate etc. 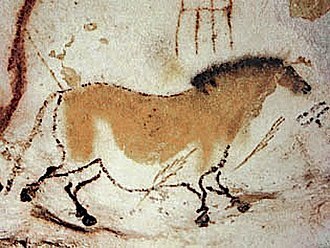 are found in the surrounding mountains. It has a population of approximately 17,000, Saluzzo was the birthplace of the writer Silvio Pellico and of typographer Giambattista Bodoni. Saluzzo was a civitas of the Vagienni, or mountain Ligures and this district was brought under Roman control by the Consul Marcus Fulvius circa 125BC. The marquisate embraced the territory lying between the Alps, the Po and the Stura, and was extended on several occasions, in the Middle Ages it had a chequered existence, often being in conflict with powerful neighbours, chiefly the Counts of Savoy. After Manfred IIs death, his widow had to accept a series of tributes, thomas III, a vassal of France, wrote the romance Le chevalier errant. Ludovico I started the Golden Age of the city and imposed himself as a mediator between the neighbouring powers, Ludovico II constructed a tunnel, no longer in use, through the Monviso, a remarkable work for the time. 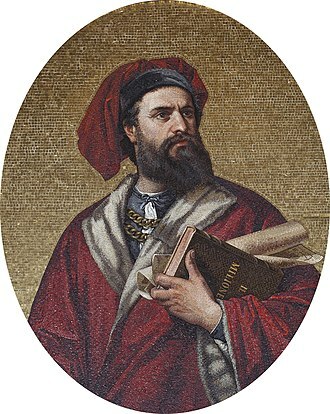 He was a patron of clerics and authors, in 1490 Ludovico regained power, but after his deaths his sons struggled longly for the rule and impoverished the state. In 1588 Charles Emmanuel I of Savoy took possession of the city, thenceforward Saluzzo shared the destinies of Piedmont, with which it formed one of the keys of the house of Italy. The Marquisate of Saluzzo is the setting of Boccaccios tale of Griselda, Saluzzo Cathedral, Church was built in Lombard-Gothic style. The façade is decorated with rose-windows and statues, the interior contains a magnificent Baroque high altar, plus a 16th-century terracotta group portraying the Deposition, ad Adoration of the Shepherds by Sebastiano Ricci. San Bernardo church formerly belonging to the Conventuals, has interesting tombs of the counts della Torre, San Giovanni, Dominican church begun in 1330 in Gothic style and completed in 1504 with Bramantesque influences. The apse, from 1504, houses a Funerary Chapel of Ludovico II, work by Antoine Le Moiturier covered with green stone, the sepulchre of Ludovico II is a Renaissance work by Benedetto Briosco. Racconigi is a town and comune in Piedmont, Italy. It is located in the province of Cuneo,40 kilometres south of Turin, the town was founded in medieval times. 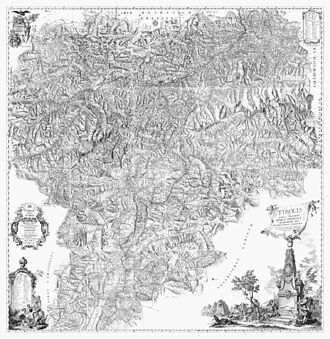 It was a possession of the marquisses of Saluzzo, of the princes of Acaia, Racconigi is located in the northern borders of its province with the one of Turin. The town borders with the municipalities of Caramagna Piemonte, Casalgrasso, Cavallermaggiore, Murello and its municipal hamlets are Canapile, Migliabruna, Parruccia, San Lorenzo and Tagliata. The economy is based on agriculture, production of milk and meat. Castle of Racconigi, This royal residence built in 1570 on the basis of a castle which dated to the beginning of the second millennium. The large park was laid out in 1755 by the French gardener Molard from designs by Le Nôtre, the castle became the summer residence of the King of Italy in 1901, and part of the World Heritage Site Residences of the Royal House of Savoy in 1997. The interior decoration and antique furniture were commissioned to the artists who worked for Castle of Racconigi. Saint-Gobain S. A. is a French multinational corporation, founded in 1665 in Paris and headquartered on the outskirts of Paris, at La Défense and in Courbevoie. Originally a mirror manufacturer, it now produces a variety of construction. The company is a component of the Euro Stoxx 50 stock market index, since the middle of the 17th century, luxury products such as silk textiles and mirrors were in high demand. French minister of finance Jean-Baptiste Colbert wanted France to become completely self-sufficient in meeting domestic demand for luxury products, Colbert established by letters patent the public enterprise Manufacture royale de glaces de miroirs in October 1665. The company was created for a period of twenty years and would be financed in part by the State. The beneficiary and first director was the French financier Nicolas du Noyer, receiver of taxes of Orléans, the company had the informal name Compagnie du Noyer. To compete with the Italian mirror industry, Colbert commissioned several Venetian glassworkers he had enticed to Paris to work for the company, the first unblemished mirrors were produced in 1666. Soon the mirrors created in the Faubourg Saint-Antoine, under the French company, the French company was capable of producing mirrors that were 40 to 45 inches long, which at the time was considered impressive. Competition between France and the Venetians became so fierce that Venice considered it a crime for any glass artisan to leave and practice their trade elsewhere, especially in foreign territory. Nicolas du Noyer complained in writing that the jealous Venetians were unwilling to impart the secrets of glassmaking to the French workers, the distractions of Paris proved distracting to the workers, and supplies of firewood to stoke the furnaces were dearer in the capital than elsewhere. In 1678, the company produced the glass for the Hall of Mirrors at the Palace of Versailles, in 1683 the companys financial arrangement with the State was renewed for another two decades. However, in 1688 the rival Compagnie Thévart was created, financed in part by the state, the two companies were in competition for seven years, until 1695, when the economy slowed down and their technical and commercial rivalry became counterproductive. Under an order from the French government, the two companies were forced to merge, creating the Compagnie Plastier, in 1702 Compagnie Plastier declared bankruptcy. A group of Franco-Swiss Protestant bankers rescued the company, changing the name to Compagnie Dagincourt. In 1789, as a consequence of the French Revolution, the state financial, the company now had to depend on the participation and capital of private investors, although it continued to remain partly under the control of the French state. In the 1820s, Saint-Gobain continued to function as it had under the Ancien Régime, manufacturing high-quality mirrors, however, in 1824, a new glass manufacturer was established in Commentry, and in 1837 several Belgian glass manufacturers were founded. While Saint-Gobain continued to dominate the luxury high-quality mirror and glass markets, its newly created competitors focused their attention on making medium, the manufacture of products of such quality made mirrors and glass affordable for the masses. Italian vehicle rear number plate used from 1951 to 1976, LI is the provincial code of Livorno. 1976-1985 front and rear Italian car number plates. ROMA is the provincial code of Rome. Palazzo Dogana, the provincial seat. Daunian earthenware pot, 550–400 BC, found in Foggia.